My four decades in the Bible – Part I | Open Our Eyes, Lord! I listened as they told me that whatever the church had taught me was false, and that this group was the true interpreter of the Bible. They talked a little about the cross of Christ, but it was tucked away in a corner of one of their workbooks, almost invisible. Their real agenda was clear. From Genesis and Exodus they proved that I had to cease from work and worship on Saturday, not Sunday, or I would be damned. From Leviticus they demonstrated that if I ate pork, shellfish or other animals, I would be lost eternally. I three-quarters believed them, enough so that I started eating kosher. (Imagine my horror one day when I bit into my lunch and realized my mom had packed me a ham and cheese sandwich! I spit it out – but had the damage already been done?). In fact it was also my mom, when I explained why I didn’t want to eat ham anymore, who told me she thought that this was a cult and that it was twisting the Bible. Were they distorting the Scriptures? Or were the Baptists the bad guys? I had to know. So at age 14, I vowed that I would never again believe anything anyone said about the Bible, unless I could prove it to my own satisfaction, using just the Bible. I picked up my King James Bible, the one with the tiny print, the one with my name embossed on it, that I’d gotten years earlier. Where should I turn? God led me, I have to believe, directly to Galatians, and later to Colossians. Wherever I’ve lived, that Bible has gone with me, and once in a while I open it to see those same verses. I didn’t just learn that I didn’t have to worry about Sabbath or kosher food – the main lesson was that I should be focused on Christ, his death and resurrection for me. I don’t know what upset me more: that someone had tried to rob me of Christ, or that I had been totally unequipped to defend myself against spiritual predators. So I studied and studied and sat down and wrote out about six pages, meeting points taught in the literature with Bible verses that I had discovered. The woman in charge of the group wrote me back and we also talked on the phone. I told her, Thank you, but I’m not convinced, and I’m finished with your group. It was that experience, mixed with a healthy dose of the “question authority” mentality of the culture in 1972, that laid an important foundation for the rest of my life. In politics as well as theology I am a real devil’s advocate. Someone falsely criticizes a Democrat and I leap to his defense; someone wrongly calls a Republican a reactionary, and I show why she is not. I push for a fair hearing for Arminians and Calvinists, for complementarians and egalitarians. This is one reason why people have a hard time figuring out my political views, and why I tend to be a nuisance in Facebook discussions. I was able to manage the fine print King James Bible, and still can, so long as I have my reading glasses. But it was a hard slog going through the Old Testament for the first time. 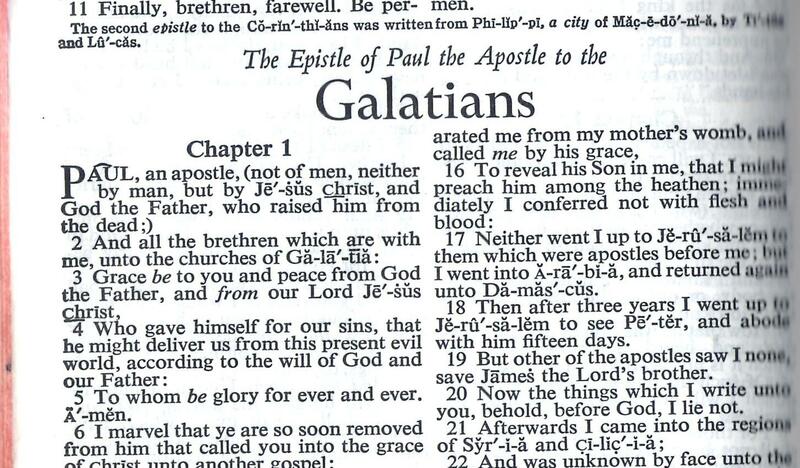 My parents gave me a Living Bible for Christmas, 1972, and I finished the whole Bible in that paraphrase. I also got hold of a pocket New Testament, the Revised Standard Version. [Those are versions I don’t recommend today – in fact, both are off the market; also, I do like the New Living Translation, and I often use the New Revised Standard. But the Living Bible was fine for what I needed.] Every day I read some chapters, and I pulled out my pocket Bible whenever I had a spare minute. Within a few months I was able to write in the inside cover that I’d read the whole Bible. I started again. Those were glory days, reading through the Bible for the very first time! Again, I have to give the Spirit credit, since I had little idea of what I was doing: he taught me that we don’t simply study the Bible, we seek God through its pages. The goal of our study is to bring God glory, enjoy his presence, pray to him based on the truths we read. I learned to confess my sins, and experienced the Lord’s transformation, in particular quickly cleaning up my habit of using bad language. Around this time I started to listen to Christian radio. My favorite program was “Through the Bible” with J. Vernon McGee, who took his listeners on a “five-year safari through God’s Word.” Those of us who heard him will smile in remembrance of his Texas drawl and homespun stories. Years later, I realize how many doctrinal differences I now have with him. Nevertheless he taught me a fundamental lesson: the Bible is not just a collection of verses. It’s composed of books, and you should read them as such. Read the Bible in context! Pay attention to the flow of revelation and the story of redemption! The Bible makes sense! I began to think in terms of God’s ongoing message, not isolated verses. This blog is continued HERE. NOTE 1: My interactions with Seventh-Day Adventists have been almost perfectly bipolar. On the one hand, a local Adventist group drew me away from the true gospel and damaged my faith, for just a few months, Glory to God. That group most definitely stated that my salvation was at stake if I didn’t obey their doctrine. On the other hand, I now have several Adventist friends and students in my current locale. When we first met, we all sat down for a two hour conversation so that I could ask them questions about their faith, their understanding of the gospel, the relationship of faith and works, the doctrine that worshipping on Sunday is the mark of the beast from Revelation, and so forth. The experience was a healing one for me, as I heard them testify to their faith on Christ alone for their salvation and their explanation that, while Adventists differ, their observance of the Sabbath and dietary restrictions were for them denominational distinctives, not a reason to separate from other believers. I respect that there are differing views on whether Adventists are evangelicals; in my experience, our confusion is due in part to the wide variety within Adventism itself. I went down a similar route, much later in life, but didn’t go back to eating pork or shellfish. With the benefit of hindsight I now see the error of my ways. I know people who buy ‘kosher’ meat today! These animals have been slaughtered by unbelievers! ONLY Jesus Christ makes us kosher..PERIOD! It is heartening to know that there are folk in the SDA that trust in Christ ALONE for salvation. As you raised the subject of Calvinism and Armenianism, where, if I may ask, do you stand in this great theological controversy? I have been called a ‘dyed in the wool, 5-point Calvinist’ because I believe Calvin only discovered what was there in the Scriptures. I have been called a heretic, Roman Catholic and a lot else beside! Don’t get me wrong, I don’t go up to folk and call myself a Calvinist, I am a blood bought believer in Christ. Hi Colin, always great to hear from you. I am a Calvinist, although, like you, that’s not the name I introduce myself with. I have met too many fellow-Calvinists who are enamored of Calvinist theology and seem awfully pleased with themselves for having become Calvinists. I’m sure I’m not speaking of you. I have heard too often the idea that Calvinism is just the Christian gospel; therefore if you are not a Calvinist, you are not a Christian. This is faulty logic. Do you know the book Killing Calvinism? I deeply sympathize with the author. While I believe the 5 Points, I do not consider them the heart of the gospel, nor even the heart of the Reformed message. Rather, the Synod of Dort spoke to these five points as a reaction to five points in the Remonstrants. For me, this is an accident of history that these five points and not others became known as the message of Calvinism – I certainly don’t think Calvin would have agreed. Our sin drives us to God for mercy; God’s election drives us to humility and gratitude; his atonement drives us to the cross; his call drives us to repentance; his preservation of us drives us to holiness. His gospel drives us to the mission. I believe Spurgeon did much to propagate what you say, when he said ‘Calvinism is the gospel’. Having said that, he said he only wanted to be known as a Christian, he just agreed with Calvin’s theology. Labels such as Calvinism, or in fact any word which ends in ‘ism’ can cause much discord within professing Christianity. There is much ignorance because many are not willing to dig. If I were PRESSED to describe my full Christian credentials thus far in my life as a believer, I would call myself a ‘Five point pre-millennial, post-tribulation Calvinist’ I think I am the only one in my town! I believe the doctrines of Calvin are recorded in Holy Writ, it is NOT an invention, such as Roman Catholicism, Dispensationalism etc. When I first discovered that I was a five point Calvinist, I was almost horrified! This is because of the vitriolic attacks the doctrine comes from within certain quarters of Christendom. There are many within reformed Protestantism so-called that are a-millennial. Many protestants I suppose were content ONLY with getting rid of the Pope and the unbiblical rituals etc. I have just looked up ‘Killing Calvinism’ on my kindle and will start reading later. ‘If those we support succeed in being elected, we must not suppose all they will do will be right. If those we oppose succeed we must not suppose all they do will be wrong’. Romney or Obama, who will you vote for?? Gary, I have loved reading this post and look forward to the sequels. After years of enjoying the privilege of being your colleague and a fellow traveler, these paragraphs give me a deeper (and delightful) glimpse into why you are who you are (and I’m *not* just referring to the nuisance disclosure!). Well done. Keep it coming. And don’t let them rob you of Christ and his cross! “I tend to be a nuisance”…ha ha ha, I can relate. Actually relate to the whole point about not being exactly the same as conventional doctrinal positions; only I think they have stronger words than nuisance for me. Thanks. fantastic, what a journey, so much and the lord has led you and protected you, faithful one love to you from us.